Some people absolutely detest doing laundry, and so they put it off. Or they don't have time to do a load or two daily. Either way, unfortunately, whether you like or not, the wash has to get done eventually. But although there are many people that swear that they tame their laundry piles by doing a load, or more daily, you don't have to do that. After a certain point it is harder to get clothes clean, because of smells or stains, so a good rule of thumb is to wash your clothes at least weekly, when you can. But that still allows you to wash them all in one big session once a week! So that's what the ladies below do. They have clean clothes, bedsheets, etc. for their family just like someone who does the wash more frequently, but they've chosen to do it, for a variety of reasons, in a big marathon session each week. That is absolutely fine! As long as it gets done consistently, and everyone typically has clean clothes, who cares what method you use, right? 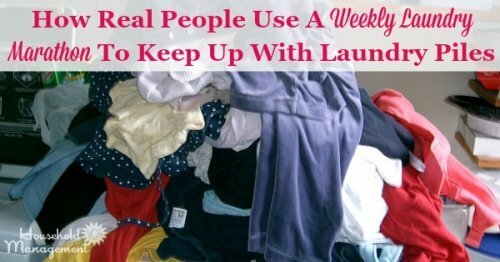 So check out these schedules and routines below and if you hate laundry you might want to try this method too and see if it works better for you too. To learn more about why I think you should have some type of schedule or routine for your laundry, check out my article on why to make a laundry schedule. In addition, I'd love to hear about your own schedule or routine. You can share how your family manages laundry here and I'll some of the best ideas and routines here to the site! 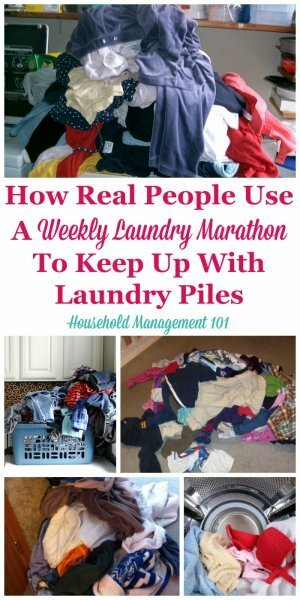 So now, scroll down to see how real people use the weekly marathon laundry sessions to keep up with their laundry! While I myself found in my home doing some laundry daily works best, that does not suit every household manager's likes and dislikes. That's perfectly fine. The point is to do what works best for your family and if it ain't broke, don't fix it! See how Pam does her laundry below. I am a mother of three, and five people total live in my house. I could never do laundry daily, because I hate laundry! Therefore, I just have one laundry day every week where I wash all the clothes. Generally this means that I do laundry all day, a real marathon session. Then, at the end of laundry day, once all the clothes have been washed and dried, and the kids are in bed, I watch TV and fold everything. Everyone helps me put everything away the next morning. I had to buy some extra clothes to do this, because I wash clothes so infrequently, but it is well worth it to me to not have to deal with it everyday! Thanks Pam for sharing your laundry schedule with us. Thursday is laundry day here for 6. I have tried the couple loads a day thing, but it seems like all I do is laundry and no one ever has clean clothes! I will have my 10yo help sort/switch out loads then I fold and sort it all that evening while watching TV. Then the older kids take their's to their rooms while I put mine, hubby's, and baby's away. I usually iron all of hubby's work (professional) clothes on Sunday evening. I will admit that sometimes the clean clothes get put away on the next laundry day so I can have the baskets back though! lol!! I am a mom of 4 boys, and wife of one husband. My weekly schedule keeps my sanity and my kids clean. 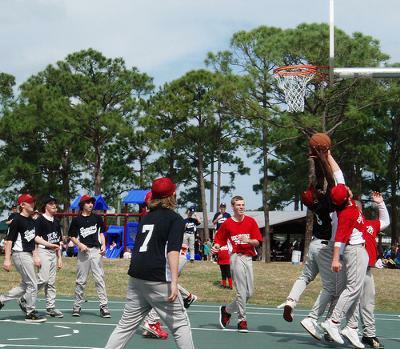 My boys play sports baseball, basket ball and Football. Their ages are 10, 8, 6 and 4 years old. I wash comforters and coats once a month unless soiled. This schedule for me is perfect. Not too nerve racking and I am never overloaded. I am so happy I bought a large machine, for a family as big as mine. My super capacity washer just broke down a week ago and I am forever grateful it did! So, do you have a laundry schedule you would like to share? If so, click here, and join the party! I do most clothes on Thursdays & Sundays. Sheets & towels on Mondays. Rugs and blankets as needed...about once a month. I try to get most of my housework done on Sundays. Then I have time to get into homeschooling and light housework/laundry on Monday & Thursday. I am a homeschool mom, so it is wonderful to be able to do it around schooling. I am very thankful for my schedule and feel sorry for the people that can't have it this way, and want to. I don't have a laundry schedule, per se. With hubby being a pilot, he will contribute a lot of white AND darks when he returns from a tour. I, too, have 4 kids...all boys ages 10, 8, 6 and 4. I encourage ALL parents to teach their children how to do laundry. I do over 20 loads per week. Here are several things that have helped us. First, I have 2 of the wheeled laundry sorters with 3 compartments each. From left to right they are: light colors, reds, darks, denims, towels/linens, whites. I also have a hamper in each of my older children's rooms and one in the "boys'" bathroom. My younger 2 put their dirty clothes in the bathroom hamper. I empty it every other day to put into the large sorters, where hubby and I put ours. My older 2 put their clothes into their own hamper. 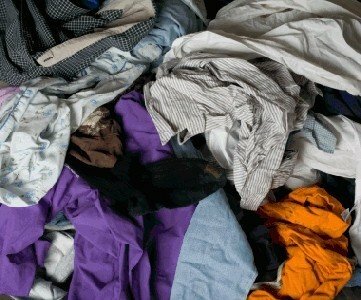 One day each week, the older 2 must wash, dry, fold/hang and put away their own laundry....this includes bedding. To make it even easier, I have them toss in a Shout color catcher....I don't have to worry about colors bleeding together. The ONLY exception to this is school uniforms, which I choose to launder myself to make sure all stays in good repair. I Do The Marathon Thing Too! I have 3 boys and a household of five is just killer with laundry. I try to do all the laundry in 1-2 days. I stay at home with the kids so that is fine for me. Remembering the laundry every day, going up and down would make me crazy. I don't really iron much. My husbands work shirts get dry cleaned. I tried doing them myself, but even a stay at home mom's time is valuable and it just took way too long to iron all those shirts! For the few bucks it was worth my money! Thanks for sharing your method for keeping up with laundry, even when you don't enjoy it. What some people don't realize is that if they do this, they are actually following a schedule, despite not doing it every single day. 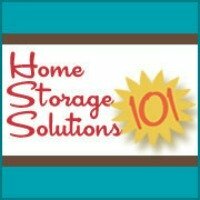 You can get more ideas about keeping up with your laundry here, or share your own methods. Further, you can explore other laundry schedules, routines and methods for keeping up with the laundry used by other people here, to find the method that will work for you! Comments for I Do The Marathon Thing Too! So, when do you do the ironing? My marathon laundry day has to also include ironing all of my husband's shirts and pants along with my clothes that have to be ironed. Wears me out! I would much rather have a marathon laundry day. I work at home, so I look for my lightest load of conference calls and do it that day. As for the question of 'when do you iron', my question is this...who still irons and why? If you take out your clothes immediately and hang, you have no issue with that. Ironing is a rarity and we all look sharp and neat. Right now I just spend a whole Sunday doing laundry. So far devoting one whole day to getting it done is what works best for me. As a social worker I never know what my schedule is going to be. So it is an adventure to make sure that laundry is done. 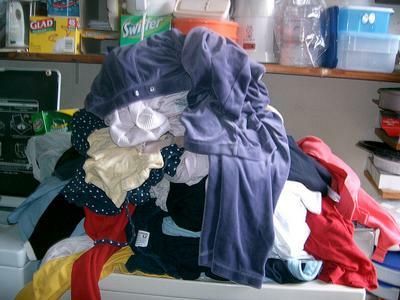 Every morning that I am planning on being home in the evening I throw a load in and when I get home I switch it over and throw in a new load, do some household chores and hopefully at some point in the evening this household of three adults (newlyweds with a roommate...what an adventure) I get a chance to fold. My sweet husband tries to help on the crazy 90 hour work weeks but I have learned that I just have to make time to do it or I have to take time to go shopping to buy new clothes! I have 8 children and I do 2 or 3 loads a day every day except Sunday. I don't do another load if there are 2 loads waiting to be folded. One load in the dryer and one in a basket placed in front of the dryer. I fold a load if I need to wash another one. The hour long folding sessions were far too discouraging for me. Each child has an empty basket in the laundry room and they put their clothes away when the basket gets full. I put away clothes for the littlest ones. I used to do 7 loads on Monday and several on Thursday but switched in the last couple of years to a couple of loads a day. I do laundry every day. There are 3 of us. I can't stand wet towels. I could never handle an all day laundry session. This way it isn't too much, and I can iron a few pieces. Also, I partially dry some things, and this leaves me plenty of room to hang things up to finish drying. There are many things that will shrink such as bras, or delicates. I steam iron pants and blouses, and they also need to hang until completely dry. I do iron, because I want our clothes to look as well as they can, and I enjoy it, if you can imagine that. But, it's a quiet time for me. I do 3 loads a day. My husband has dirty work clothes, and they have to be ironed for his company. I do laundry on Mon, Wed, and Fri when I get home from work to keep up with my husband's work clothes. I try to do underwear, socks, bras, pajamas and my scrubs on Monday. Shirts and pants for the family are Tuesday. Wednesday is bed linens (and once monthly, I pull off and wash the mattress protectors). Thursdays are towels. If there is anything extra, I will either wait until a laundry day or do the extra, especially if it's needed. My hardest part is actually getting folded and put away. I know I went out and bought more underthings as I wasn't getting laundry done fast enough. Now that I am more mature (54) I am thinking maybe the problem is too many clothes. I like doing the marathon way, tried schedules and always felt bad that I didn't do it that way, a few weeks ago I thought I hate schedules so I stopped beating myself up and do my marathon, just more frequently. It works for me, when I asked my neat freak sister she said I do it that way every Thursday night! Who da thunk? I love laundry . . . oh, who am I kidding? I love, love, love laundry! Oh who am I kidding!!!!! I hate laundry. It is a horrible household task. I just am trying to use the reverse psychology approach in hopes that it gets me to not hate the task so much. Finally received a needed part for one of the machines three days ago. 3 loads yesterday, 4 loads Saturday. That is all I know I will be able to get hung up or folded, and put away. Whew! 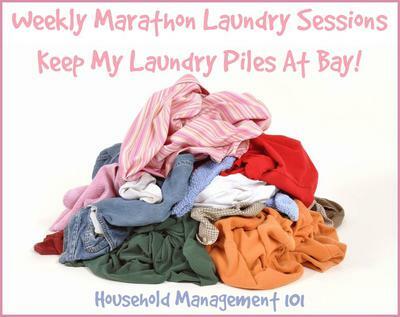 I did the marathon method of laundry for several years while many kids were very young. I spent a lot of time sorting and folding and sorting some more. And I spending a whole day doing laundry. Then I had a great idea. Each child has their own laundry day. Our oldest washes his clothes Monday. Middle child is Tuesday. I usually have a load or two of my and my husband's clothes and towels on Wednesday. Youngest is Thursday. Whites and reds get done on Friday. It cuts down tremendously on the sorting. And now that my boys are teenagers they can do it themselves. I have found doing laundry on a Saturday works for my household the best. The first load is mine and hubby's work shirts, then our pants. Next would be the girls school uniforms. Then home clothes but there is only 2 loads and I finish off with girls and sheets. I hang all on the line. Most lines have four sections so each family member has a section. 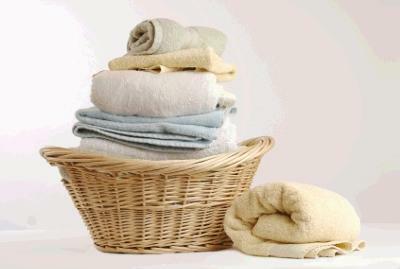 When dry I fold from the line and as I come in the towels go straight away and then each basket is delivered to the persons room and put away. I start about 8-9 in the morning and I'm finished just after lunch. I have found it easier not to have too many home clothes. The girls have 2 good outfits each and enough shirts and shorts to last a week for when on school holidays. I don't feel that we need draws over flowing with clothes. I have been doing it this way for years and works perfectly. I also work full time. I think every body hates laundry. This is a technique I used when I was in college. I call it prioritized laundry. Always have 2 or 3 laundry baskets, in my case I used old pillow cases. 1 for each: whites, delicate and colors. Every Wednesday I used to do 1 pile based on what I needed. Also my daughter does hers since she was 12. I like doing laundry twice a week in my house. Working outside the house plus having a small sewing business on the side, I don't like to spend all day Saturday or Sunday doing nothing but laundry. So one evening a week, I really don't have a set day of the week, I try to get everything that is dirty washed. Then on weekends, I am not a slave to it. And I have my weekends to spend more time doing things I love to do. Like sewing or hanging out with my daughter and her family, my husband or my 18 year old daughter, who by the way still lives at home and her laundry is included in ours, to save money. But like all the comments I have read here - it depends on what works for you. Good luck and have fun with it. Dance while you fold, sing while you sort and let the little ones play in the clean basket full. Laugh - that is what is important. You get away with four loads, but that doesn't work for me. I have boys who play sports and their uniforms are cleaned every other day, that is enough for me. If I could do less I would, but even now with them being 14,13, 11 and 8, my how they have grown...lol they are big boys and my husband only needs shirt to fill the wash (joking ) he is 6'2 lol.. But you gotta do what works for you. I too have 4 boys they just are 20, 17, 15, 14. Get ready Jo the laundry just gets more and more. I do 3-4 loads a day just to keep up with their work clothes and sport clothes. It could be a full time job just to keep the laundry caught up so needless to say I never am caught up. I too take care of a household with 4 boys, but I only have 25 hours a week to do everything. Why not save yourself some time and do all the colors in one day, whites, sheets and towels on another? That's only two days a week. That saves loads (:pun intended:) of time to do other things, and your not tied to the washer and dryer all week. For me that doesn't work due to having to clean the sports equipment. I did a total of four loads a week, max 2 loads per day. I mainly due two loads on Friday. I too have four wonderful boys ages 10, 8, 6 and 4. I do laundry 3 days of the week. 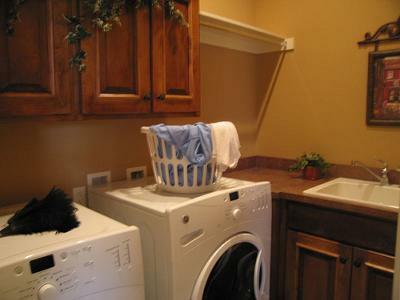 I have a king size front load washer and dryer. I have a simple routine that usually ends up with me being last, but most important first. Work clothes for DH, jeans, shirts, and tall socks for his boots. Next comes bottoms for my two DSs, 9 & 8. They have plenty of t-shirts to last at least two weeks. Then comes my clothes, one uniform for one job, one nice office clothes for another job. While it seems that the looming basket of socks grows even after I fold the clean ones and distribute them, I manage to toss in undies for everyone and there are always comfy clothes to slip into after work and school. My boys learned how to separate clothes at a very young age. I have a 3 boys 14, 13, and 10. My boys learned to separate clothes at a very young age. I wash towels on Mondays and Wed. On Fridays after school, the boys will put all their clothes together and help separate. So I do loads all weekend. Maybe 2 on Friday. 2 or 3 Saturday morning. The rest on Sunday. That way I won't be so overwhelmed with laundry. The linens and heavier items I wash them as they get dirty. 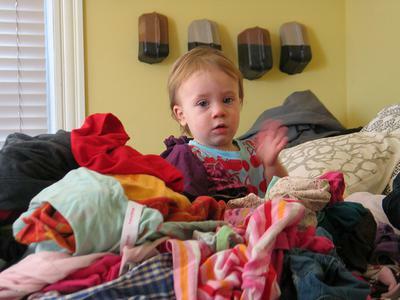 With kids in general, items don't stay clean for long, So, heavier items get washed about once a week. Hope this helps. I have my 3 year help put clothe in the washer, hang the clothes on the drying rack, and he folds his own and puts it away. If it's not done right then he does it until its correct. My 2 year old is helping with the drying rack and puts the clothes in the washer as well. I think it's a great way to start chores. A load a day, keeps things manageable! Also, getting your kids to pitch in, for however little, is crucial for later on. I have a 5 and a 7 year old and they started with just cleaning the lint compartment and pairing socks. We are now at the point where they can do a load of their own clothes with little supervision. What do you do when your future step-children don't ever want to change underwear & socks!! Their 14 & 11 yr old twins!!! I just wash everything at once and that's it! If Saturday is going to be a busy day I will start Friday evening. When I get up in the middle of the night I will change the load. Then when I get up Saturday change load before I start breakfast. About the time I cook and we all eat it's time to switch again. Then we will start getting ready for the day and about the time we leave all clothes are done. It does help that we have a triple laundrymat type loader. There are six of us.